When you think of millionaires' neighborhoods, you might picture Manhattan's Park Avenue, San Francisco's Pacific Heights, or Los Angeles' Rodeo Drive. 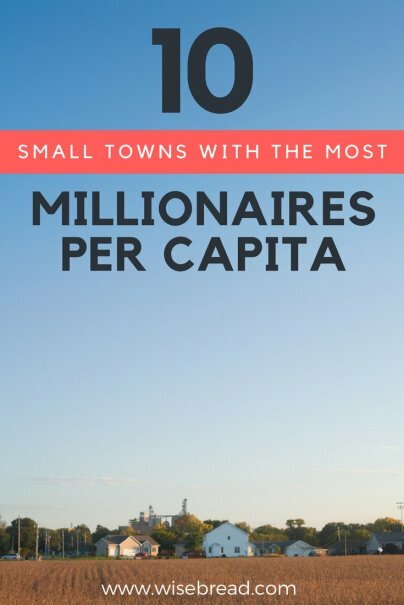 But did you know that a third of the towns with the most millionaires per capita are little more than hamlets with around 20,000 residents? What do these mini-cities have going for them to attract the wealthy in droves? For some, it's scenic beauty and recreational opportunities; others seem to make their own millionaires with rich natural resources or high-paying jobs. We can't promise you'll be rich if you move to one of these towns, but who knows? A little gold dust might rub off on you. Los Alamos isn't just a small town with the highest density of millionaires — it has more millionaires per capita than any municipality, big or small, in the nation, and it has held that spot for more than a decade. The funny thing is that Los Alamos doesn't look like a wealthy town. It doesn't have the Fendi boutiques or Michelin-starred restaurants you would associate with the lifestyles of the rich and famous, and it doesn't have the beach or ski resorts that tend to draw millionaires to other locales. There is only one explanation for the density of millionaires: The Los Alamos National Laboratory, where engineers and other highly trained employees earn an average annual salary above $100,000. This ski destination became the location with the second most millionaires per capita in 2014 and hasn't slipped since. You might not have heard of Summit Park, but you have probably heard of nearby Park City, host to Robert Redford's famous Sundance Film Festival. That's one explanation for the density of millionaires in Summit Park; spillover from glamorous Park City. It was riches that originally created Juneau; the Gold Rush, to be exact. Today's Juneau millionaires probably don't trace their wealth to gold, but they may have other valuable things found under the ground to thank. Alaska in general has an embarrassment of millionaires — Phoenix Marketing International puts it at number five among all states for millionaires per capita. This probably has to do with the state's richness in natural resources such as petroleum. Many farmers in this rural town receive tens of thousands of dollars per month in oil royalties, making for a low-key type of millionaire who would look less out of place at Farm & Fleet than at Emporio Armani. This booming town in Litchfield County has long been a getaway for Manhattan's elite looking to escape the city. Gorgeous scenery, along with great food, shopping, and culture make this a coveted area for the wealthy. The explanation for the millionaires in Edwards is similar to the explanation for Summit Park: proximity to a ritzy ski town. Edwards is quite near Vail Ski Resort. Don't expect to see all those millionaires midweek though, since they may not live in their mansions — ahem, cabins — full time. Another mining town, Gillette made its fortune off coal as well as uranium. You can catch a glimpse of what made so many of these Cowboy State residents wealthy at the free Campbell County Rockpile Museum. All you need to know about why this town has so many millionaires is this: It's located on the island of Martha's Vineyard. Presidents vacation there. Bill Gates, Oprah Winfrey, Larry David, and David Letterman own summer homes there or are seen around town regularly. You might have never heard of this town, but another familiar name can explain why it has so many millionaires: Microsoft. Oak Harbor is located on Whidbey Island, a short drive from Seattle. Billionaires Bill Gates and Jeff Bezos don't live there (they're neighbors in nearby Medina), but it's likely that Microsoft midlevel managers swell the ranks of millionaires in Oak Harbor. The Jackson Hole you've heard so much about isn't actually a town, it's the valley that hosts the town of Jackson. So, you guessed it; this is another ski playground for the rich, which encompasses areas in both Wyoming and Idaho. It also happens to be the most economically unequal metropolitan area in the U.S., with the top 1 percent bringing in an average annual income of $20 million and the bottom 99 percent averaging just below $94,000, according to the Economic Policy Institute.